Hi, I’m Lynnette Penacho-Jackman. 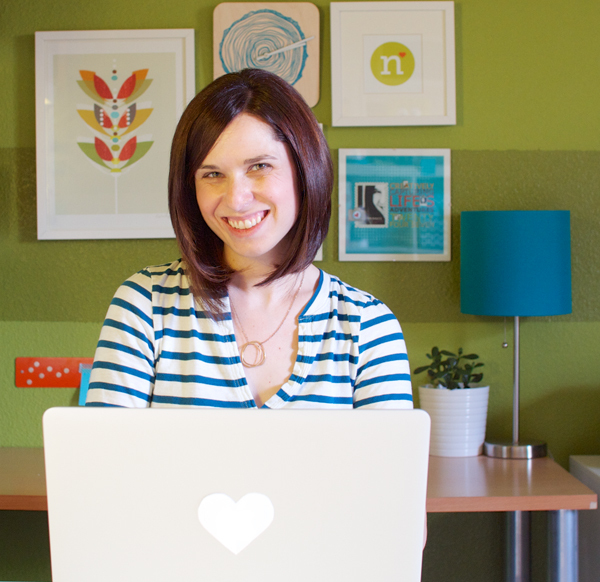 Tech-lovin’ memory keeper and hard-core advocate for telling your personal story. In 2009 I reached a point with my scrapbooking where I was ready for something new. A new challenge. A new idea. I loved the layouts I’d created but I felt like my albums lacked a cohesive story and at times, they didn’t feel like me. I decided to try something new: one layout a month featuring a list of my top ten favorite things from that month. The layout title had to include the month followed by the word FAVES. Each layout had to include a NEW self-portrait taken during that specific month. After the first January Faves layout, I was hooked. I loved how it captured a mini time capsule of my life right then. I loved that the design and colors felt like me. But most of all I loved how easy it was to put together. As someone who tended to stress about every word of journaling she wrote like she was being graded on an English essay, a top ten list of my favorite things was the easiest journaling I’d ever done. I repeated the project in 2011, 2013, 2015, 2017 & 2018 each time following the same rules but pushing myself to think outside of my own box with the design. hands-down some of my most favorite layouts ever. They added exactly what my scrapbooking albums needed: consistency, a snapshot of my life and a healthy dose of creative design. telling your personal story doesn’t have to be hard. scrapbooking yourself feels FUN, Creative, & Easy. The 2019 Monthly Faves Project is your roadmap for getting more of YOU in your albums this year. 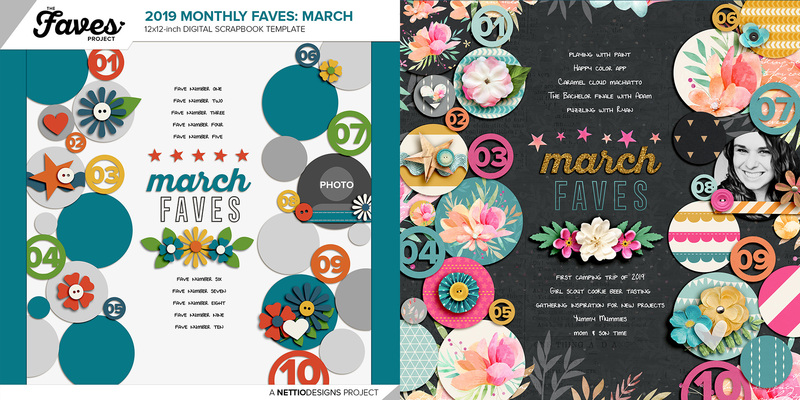 On the 28th of every month you’ll receive an all-new Monthly Faves-themed 12×12-inch digital scrapbooking template, inspiration and support designed for you to capture your top ten favorite things from that month. Simply add your own photo, text and digital goodies and by the end of 2018, you’ll have twelve completed Faves layouts of your very own! Because a top ten list is one of the easiest forms of journaling you can do. For real. Because a list of your personal faves will say more about you than a travel/event/birthday layout ever will. Because scrapbooking with friends is always more fun. Because it’s an awesome way to make sure YOU are featured in your scrapbooks too. This is my 2nd year of The Faves Project. I completed all 12 layouts in 2015, and it was exactly what I needed to jump-start my creativity after a long dry spell. and the fact that it’s DOABLE. Yeah, I’m a Nettio project addict. Who is The Faves Project: 2019 Monthly Faves for? The Monthly Faves are for any tech-lovin’ memory keeper who’d like to kickstart their creativity, get more of their story in their albums and have a fun time doing it. If you’re in need of a new creative challenge, want to get more of YOU in your scrapbooks or just feel like you’re unsure what to scrap about, I’m confident The Faves Project will be a great fit. 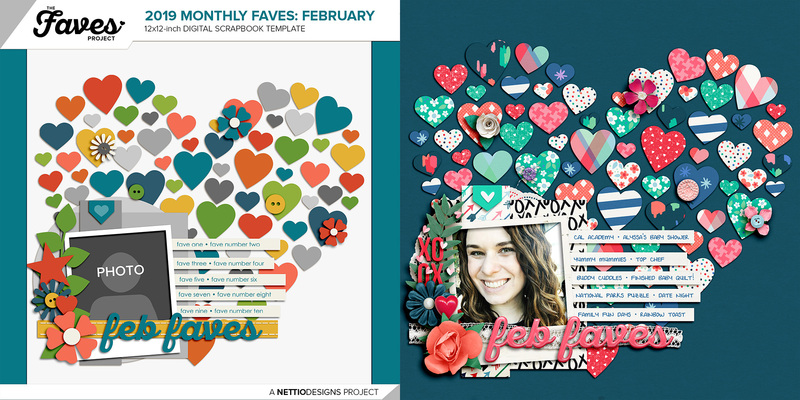 Are the digital scrapbooking templates in the Monthly Faves all new? Yes! All 12 templates will be new, never before released templates based off my own 2018 Monthly Faves layouts. Do I need to be a digital scrapbooker to participate in the Monthly Faves? Because the Monthly Faves include digital scrapbooking templates, you’ll get the most out of it if you are open to digital scrapbooking. But new digital scrapbookers are always welcome! I’m new to digital scrapbooking, can I still sign up? Absolutely! 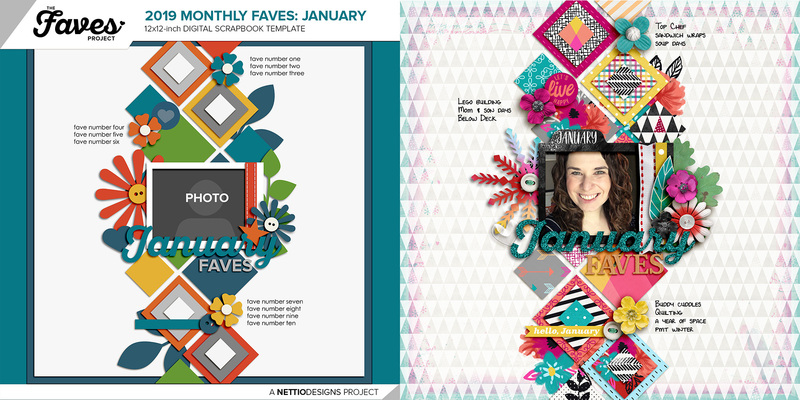 The Monthly Faves can be a great first project if you’re interested in giving digital scrapbooking a try. I’ll be more than happy to answer any questions you might have along the way. What digital skills do I need to know to participate? A basic understanding of Photoshop layers and clipping masks will help but is not required. I’ll be more than happy to answer any questions you may have if you’re new to digital scrapbooking. What software do I need to use the templates? You’ll need a program that can handle and manipulate a layered Photoshop (.PSD) or TIFF (.TIF) file. Does it matter if I use a Mac or a PC? Nope! All tech-lovin’ memory keepers are welcome. I’m a Mac user with a strong PC background if it helps. Will you consider offering your templates in (insert your chosen format) as well? 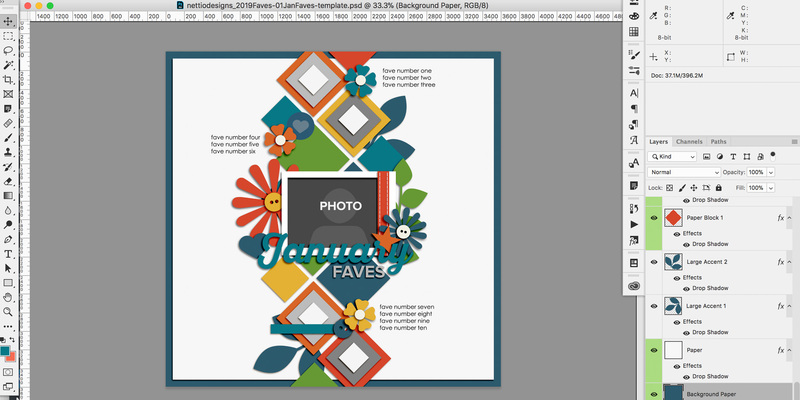 In order to keep things simple, Ithe Monthly Faves templates only come in Photoshop (.PSD) & TIFF (.TIF) format. Do the Monthly Faves templates include any drop shadowing? Yes, all of the templates include basic drop shadowing and layer styling which can be easily customized or removed. What size on the Monthly Faves templates? Each Monthly Faves template is 12×12 inches. Payment is securely processed via PayPal and can be made using your PayPal balance or credit card. After you’ve signed up for the Monthly Faves, you’ll receive three emails: one with a receipt, one with links to download the templates that have been released this year so far and a third email from me with details on how to access the private community and emails. How many templates will I receive? Over the course of 2019, you’ll receive twelve 12×12-inch digital scrapbooking templates, one template each month. When will new templates be released? New templates will be sent out on the 25th of every month. Can I sign up at any time? Yes! When you sign up you’ll receive a download link for all templates that have been released so far. New templates will be sent to you on the 25th of each month. Help! I signed up but never received an email with my downloads! First step, check your spam folder and behind the Gmail Promotions or Updates tab if you’re a Gmail Tabs user, as occasionally overzealous spam filters will flag the links in the download email. If after a few hours, you still haven’t received your download link, contact me and I’ll be happy to get it sorted for you. What do I get when I purchase The Year in Faves collection? New this year, The Year in Faves is an option to pre-purchase all five 2019 Faves Project classes for one great price. When you purchase The Year in Faves, you’ll get access to the Monthly Faves right away and then automatically receive all templates and course materials for the Spring, Summer, Fall & Holiday mini album classes. No more worry about signing up for each course individually – just a year full of fave-tastic goodness. Other questions? Email me at nettiodesigns at gmail dot com. I love the Faves memory-keeping concept that you have introduced into my life and have been keeping a Faves list every month for the past two years. It’s amazing what a rich document in turns out to be, in terms of all the memories that list will conjure up years later, of life moments both big and small.